Essential Oil Necklace with Pendant and Aroma Stone can help you improve your overall well-being and start you on the path to a more natural you. 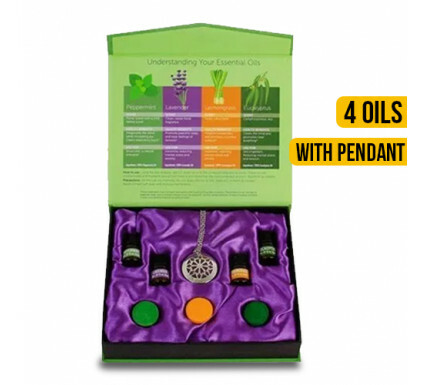 This Essential Oil Necklace Pendant is a wonderful way for you to be able to benefit from essential oils while on the go! Just add 2 drops of oil to its corresponding aroma stone. Use homeopathic alternatives to treat everyday health issues. Specifically, these remedies including PMS, insomnia, and indigestion, and re-balance your energy. In addition, they enhance your focus, and release stress. This sleek and elegant Silver necklace is an excellent way to easily incorporate aromatherapy in your day. This necklace is mini size, lightweight and portable. You can wear it every day to match different clothes. Whether you live an all-natural lifestyle or you are just beginning to use alternative methods to eliminate synthetic chemicals from your everyday products this makes a perfect addition. Best gift for aromatherapy fans and anyone who wants benefits of essential oil. Perfect for anniversary birthday, holiday, graduation, Valentine day, Christmas, or any other gift giving occasion.